In a bowl, add 1tsp ginger garlic paste, prawns heads and shells and 1cup boiling water. Cover and cook on low flame for 1/2 an hour. Pour the prawn stock into a strainer; reserve the liquid and discarding the spices, shells and heads. In a frying pan, add oil and garlic and prawns and stir fry for a few minutes. Add capsicums, carrot slices and stir fry for one minute. Then in a bowl mix the stock with corn flour and add all sauces. Pour this mixture into the pan and Simmer for another minute, or until the prawn is cooked through. 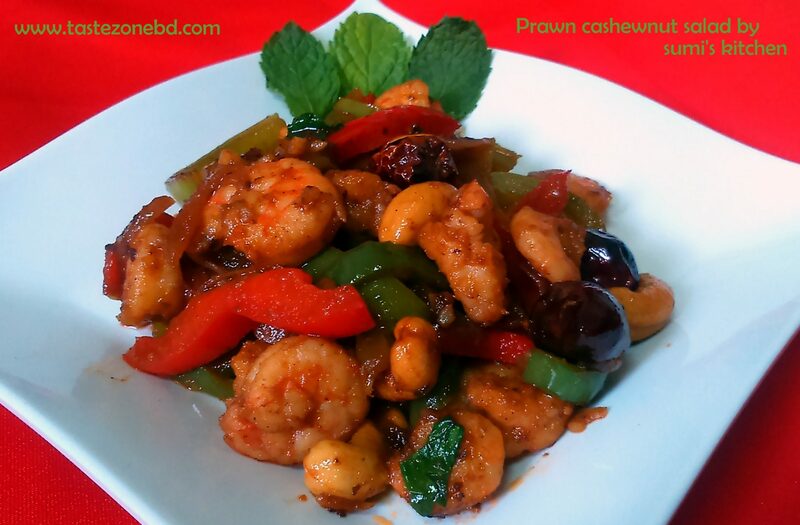 Stir in the spring onions, Red chilies and cashew nuts, season, to taste, with 1 tsp sugar and transfer to a serving dish.